Thank you to everyone who visited and shared with the hop last week. 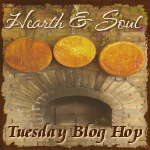 Today I am featuring delicious dips and chutneys from last week’s hop. Right, on with the Hearth & Soul Hop! Remember – Please link directly to your post, not to your home page. Your features of Dips and Chutneys look great. I just love Chutney’s and the special flavor they have. I am sharing my Slow Cooker Baked Pinto’s for the party today. Looks like you are busy having fun every week, I look forward to seeing where you are going next. Hi April! Thank you for hosting and I hope you’re enjoying the weather – we certainly are! I shared a post about the reason I tried a gluten free diet and how I’m sure it has cured my illness. Hi Vicky! I am loving this wonderful weather! Congratulations on the book, and thank you for sharing your experience 🙂 Hope you are having a wonderful week too! Thank you for the party, April. Hope you are doing well. This summer has been busy and I feel disconnected with everyone! Hi Michelle. It is a busy summer this year. As long as you are having fun though, that’s what matters 🙂 Thank you for visiting! Chutney is such an essential thing for any cheese lover… it’s much harder to buy in the US than the UK, so I’m looking with great interest at these recipes. It really is, Pauline! I love chutney too. The recipes seem to be getting much more straight-forward these days and they are for smaller quantities which I really like. Hey April – thanks so much for the feature!!! Now I need to go check out the other recipes and some of the ones linked up this week. Thanks for hosting and hope you’re having a wonderful week!